Photo: Rabbi Nicky Liss, Chairman of the Rabbinical Council of the United Synagogue, at the gravesite. January 20 is an ominous date in the calendar of Jewish history. It was on this day that fourteen heads of government departments met to discuss a plan to move 'figures' from one end of Europe to the other, and then how to dispose of the 'figures' in the most efficient means. They met at a lakeside villa, and after working their way through the agenda, they retired for a brandy. Their mandate was to devise, discuss, and implement a plan for the mechanised murder, on an industrial scale, of the Jews of Europe, the 'figures' that these bureaucrats of the German Reich viewed as sub-human. Eleven million Jews were in their sights, including the 330,000 Jews then living in England. The year was 1942. This was the fourth solution to their 'Jewish Question' after impoverishment and forced emigration from Germany in the years between the Nazi Party coming to power and the German invasion of Poland in September 1939. With the conquest of Poland, the Germans had locked Jews into ghettos where food and medicine were tightly controlled leading to death by mass starvation. With the conquest of the occupied areas of the Soviet Union, the Germans had begun a policy of machine-gunning Jews to death outside their towns and villages. Finding these solutions difficult and impractical, the plan decided at the conference along the banks of Lake Wannsee outside Berlin was to deport Jews to an 'unknown destination', 'somewhere in the East' where they would be killed by poison gas in locked chambers, their bodies burned in crematoria: The 'Final Solution to the Jewish Question'. 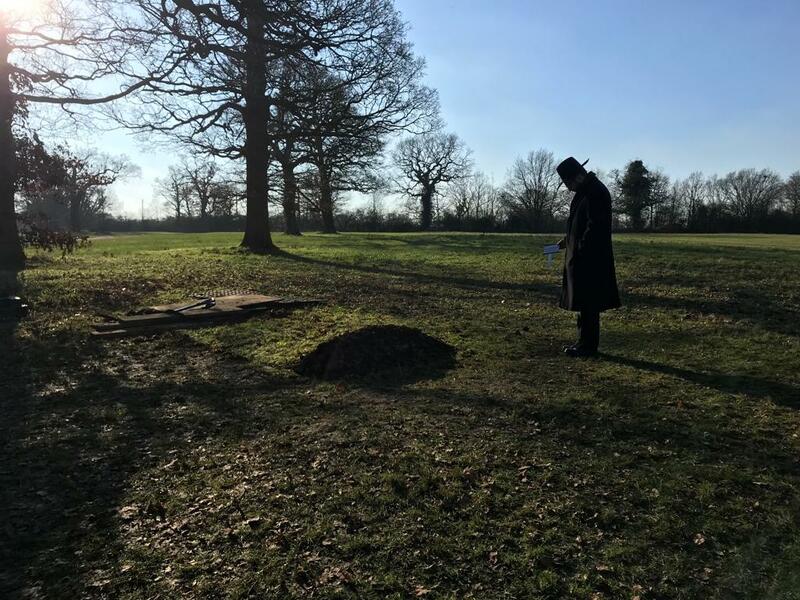 Seventy-seven years later, on 20 January 2019, an extraordinary event took place, marked with reverence and dignity, as the ash remains and bone fragments of six Jews who had been killed in Auschwitz-Birkenau, were laid to rest at a Jewish cemetery in London. The Imperial War Museum had been the repository of these ashes and so turned them over to the Jewish community. The community leaders lost no time in giving these remains a proper burial. At a Jewish funeral, it is customary to give a eulogy, addressed to the family members of the deceased who are in mourning. These remains, five adults and one child, are unnamed, unknown, and have no known history save being six of the six million Jews the Germans and their accomplices murdered between Autumn 1939 and Spring 1945. And so the Chief Rabbi of Britain, Ephraim Mirvis, addressed his remarks to them, to the remains of six Jews in a single coffin, in the presence of government ministers, clergy, representatives of the German and the Israeli governments, and a thousand Jews who had gathered to witness this burial. Survivors, children and grandchildren of survivors, and those who may not have had a direct connection to Jews who had been murdered, each came to bear witness to this final duty and honour to bury the dead, to remember the lives lived and those lost. Because there was no family to console, each witness to the burial became family. The Nazi aim had been to destroy Jewish life and culture and religion. Seventy years on from the meeting of bureaucrats who turned human life into bone fragments and ash, Jews gathered to pay their respects, to give these remains a Jewish burial, and to remember. Britain's Unknown Soldier was buried in Westminster Abbey on Armistice Day, 11 November 1920. How fitting that the ashes of these 'Unknown' few of the Holocaust were given a Jewish burial on 20 January 2019, the anniversary of the Wannsee Conference, the date their fates were sealed. We will remember them. Lady (Esther) Gilbert is editor of Holocaust Memoir Digest, widow of Sir Martin Gilbert, and Trustee of the Sir Martin Gilbert Learning Centre.